How an enzyme in the body helps cells respond to DNA damage that can give rise to cancer is the focus of research at Wright State University that received federal funding of up to $1.48 million. Michael Kemp, research assistant professor in the Department of Pharmacology and Toxicology in the Wright State Boonshoft School of Medicine, was awarded the grant (R01GM130583) from the National Institute of General Medical Sciences, which is part of the National Institutes of Health. “Ultimately, the research might be useful for improving cancer therapies and also preventing cancer development in the first place,” said Kemp. Cells in the human body are constantly exposed to environmental attacks such as ultraviolet light from the sun or carcinogens from cigarettes or car exhaust. That can damage DNA, which carries the genetic instructions used in the growth, development, functioning and reproduction of living organisms. Kemp’s research is related to a kinase, or enzyme, known as ATR, which helps cells respond to DNA damage and protect them. The most successful anti-cancer drugs also damage DNA by preventing cancer cells from being able to copy their DNA when they need to divide and causing them to die. But one of the limitations is when treating cancer with a chemotherapy drug like Cisplatin that damages DNA, ATR gets activated and helps cancer cells survive Cisplatin treatment. So drug companies have developed and are testing drugs designed to counter ATR in hopes of combining traditional chemotherapy with ATR inhibitors to make the killing of cancer cells more effective. Michael Kemp received his bachelor’s degree in biological sciences and his Ph.D. in biomedical sciences from Wright State. Kemp is conducting his research by growing cells in Petri dishes and studying how ATR controls cell survival and responds to different DNA damaging agents like UV light or Cisplatin. He has received $292,000 for the first year of his research, with the potential of receiving a total of $1.48 million over five years. Kemp grew up in Dayton and became curious about biology while attending Wayne High School. “I was interested in biology, learning about genetics and evolution. I just thought it was cool,” he said. Kemp enrolled at Wright State to study biology, graduating with a bachelor’s degree in 1999. 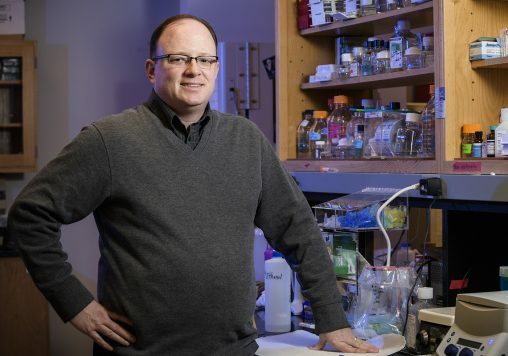 He landed a job in the pharmaceutical division of Procter & Gamble, where he worked on developing a new way of measuring a cell’s mitochondrial membrane potential that could be therapeutically targeted to fight cardiovascular disease. 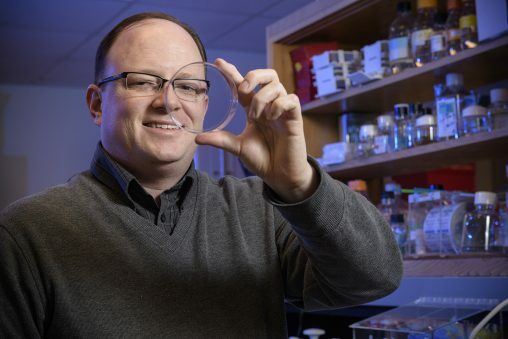 Kemp’s interest in that kind of research led him back at Wright State, where he studied DNA replication as part of the Biomedical Sciences Ph.D. Program and earned his doctorate in 2006 in the laboratory of Michael Leffak professor of biochemistry. Then he went to the University of North Carolina, where he did postdoctoral training in DNA repair. His boss, biochemistry professor Aziz Sancar, won the Nobel Prize for Chemistry in 2015 for his groundbreaking work in mapping DNA repair. The following year, Kemp joined the faculty at Wright State and works with Jeffrey Travers, professor and chair of pharmacology and toxicology. « More from Biomedical Sciences Ph.D.